While everyone has heard of Chinese tea, Chinese Coffee somehow just sounds wrong; unless it is an Al Pacino movie. And while China is famous for tea, they are becoming known in the coffee world too, both in the retail coffee shop world, and the wholesale green coffee arena. Coffee was actually brought to China in the late 1800’s by Jesuits. In the 1930’s, there was a coffee boom, when places like Shanghai were popular destination spots with the so called Western Adventurer. At that time though, many of the cafes were run by Westerners. There was a bust for a few decades afterwards, but there is another boom on the rise which really started as far back as the late 1980’s. And this time, many of the coffee serving establishments are owned or run by Chinese, and there are now plantations that produce green coffee for domestic and export, and that continue to grow in area and output every year. Coffee drinking in China is still associated with the West, and is seen as more of a fashion statement, and a luxury, than something you prepare at home on your way to work. But consumption in general is on the rise, and the numbers do bear this out. It should be noted however, that much of the coffee consumption in China is currently in the form of instant coffee. Since coffee is still fairly new, the Chinese are going to need time to appreciate freshly roasted coffee. And since instant coffee is relatively cheap and easy to find, those are just more reasons for it’s popularity. And don’t forget that tea is very cheap, is the national drink, and has been around for thousands of years; so coffee has a lot of competition in China. 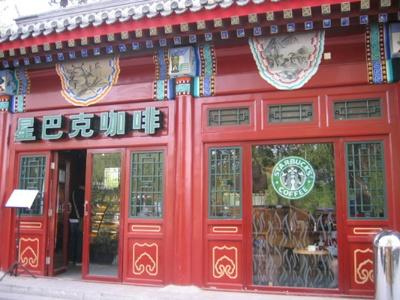 Starbucks in China by Kagemori. With regards to retail coffee, Starbucks had over 100 outlets in China in 2004, but now has over 400 locations, so the trend toward freshly roasted and brewed coffee is expected to continue it’s upward rise, even if instant coffee is still relegated to be prepared at home, complete with it’s 3-in-1 mix of freeze dried coffee, sugar, and cream. But even Starbucks needs to worry, as local competition (and outright copycats), have sprung up as direct competition. In fact one local Chinese coffee chain used Chinese characters which were almost the same as Starbucks. Starbucks sued. Sounds like coffee has many good years of growth ahead of it in China. In 1988, the Chinese government and the United Nations Development Program started a project to produce coffee in the Yunnan province. Along with Nestle, the coffee growing area grew and grew. 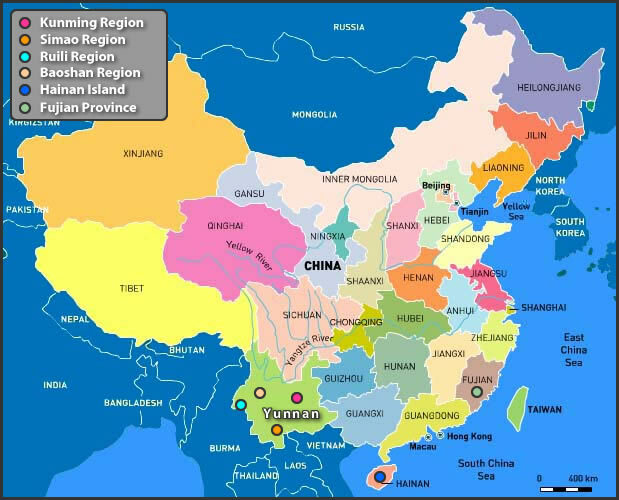 The Yunnan province has a climate and condition similar to that of Indonesia and parts of South America, so in theory the quality coming out of this area should be quite high. But they have had to fight things like quality control, and the “Dry Leaf” coffee virus. The efforts seemed to have worked, as coffee coming out of the premier Simao region is quite good considering how little time it has been. And it should get better as time goes on, as the government is now behind the effort, and the Ruili, Baoshan, and Kunming regions are also producing Arabica coffee beans. On a side note, unlike much of the Vietnamese Robusta coffee, a large amount of Arabica coffee comes out of China. They do grow Robusta, but mainly on Hainan island and in the Fujian province, but it only represents about 20 percent of the total grown in the country. So what do the numbers look like? Total volume of coffee sales grew in China upwards of 90% from 1997 to 2003, and the numbers have continued a similar rise to the present. Low green coffee prices around the world, resulted in lower retail coffee prices in China. This raised awareness about coffee, and in turn caused more investment interest in both local green coffee growing operations, as well as retail coffee shops and internet cafes. Couple that with admiration for anything considered Western (and therefore hip), and you can see why coffee is taking off. Could China of the future be the next Colombia of the 1970’s? A Chinese version of Juan Valdez? Who knows. But the fact that even small-time home roasters are getting their hands on green Chinese coffee (and enjoying it), tells us that China is capable of producing a decent clean tasting Arabica coffee bean, and the volume is there. If they keep it up, in a few years we may see Chinese coffee viewed in the same light as the likes of Kona Coffee, Jamaican Blue Mountain, and maybe even Kopi Luwak.